The late Charles Cleworth was a long time entrepreneur and a significant investor in the Futuro House in the US. 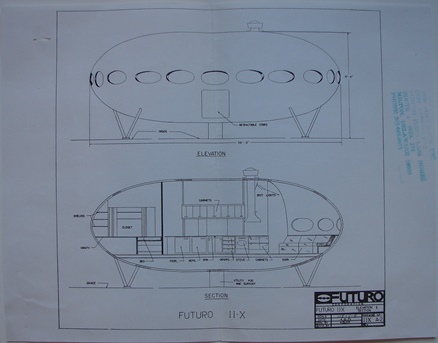 "Back in the day" Charles was the President of the Futuro Corporation Of Colorado and during the course of his involvement with the Futuro House he accumulated and stored many documents, letters, plans, drawings and other items associated with the Futuro House and the Futuro Corporation Of Colorado. "He and some other investors bought all the forms used for the molding of the plastic and were doing production here in Colorado. I remember visiting the plant on S. Santa Fe Street in Denver. 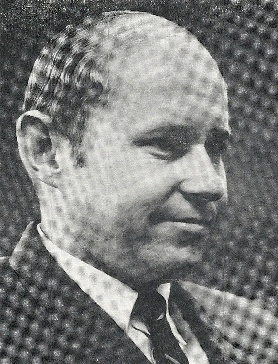 He had been in the plastics field as a publisher of magazines and had also tried his hand at manufacturing a plastic bumper (also with no financial success)." 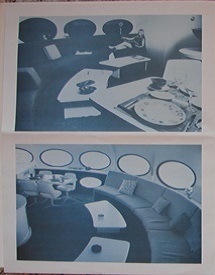 Charles Cleworth's family recently decided to pass this important Futuro archive to TheFuturoHouse.com to be preserved and catalogued. I am sure Futuro aficionados everywhere will join me in thanking the Cleworth family for their generous bequest. Cataloguing and presenting these documents here not only adds significantly to the documented history of the Futuro but also recognizes Charles Cleworth as one of the farsighted individuals who gave us all Futuro in the first place. The images displayed on this page are photos of the actual items and documents in the archive. With the exception of particularly large documents [some architectural plans for example] there will also be links to pdf files. Some items will appear twice. For example architectural plans that were part of a document package will be included in the listing for that package but also included in the section containing all architectural plans. All of the documents in the archive are from either the very late 60's or the 70's. The Cleworth family has given their consent to the archive being catalogued and displayed here. 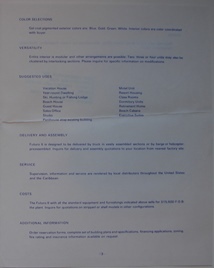 Some of the documents included in the archive reference individuals and companies other than Charles Cleworth and the Futuro Corporation of Colorado. Given the age of this material I believe it is unlikely that any of the material remains sensitive or personal [though any that does appear to be so even after 40 plus years will be excluded]. That said if anyone sees anything here referencing themselves or their family members that they would like removed please let me know by email. Though there is organization in the archive it is also apparent that there are documents in disparate files that do reference each other. 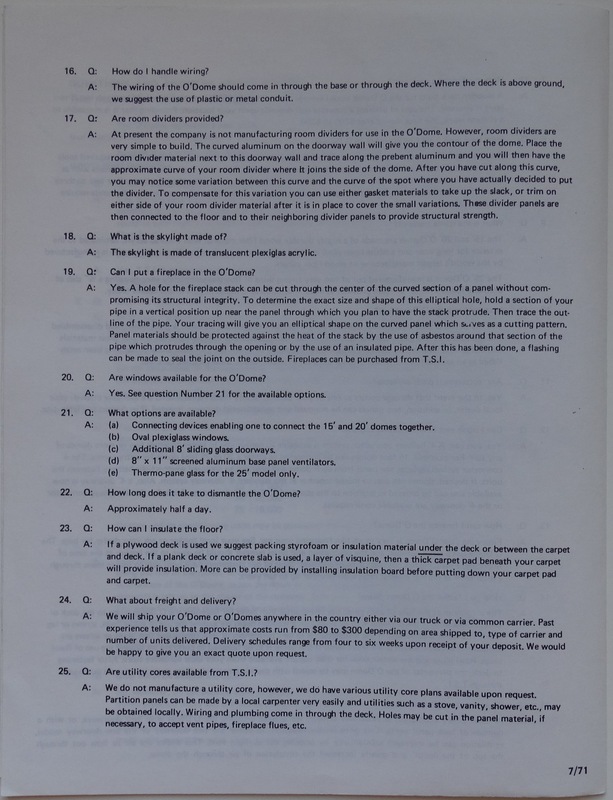 As additional content is added to this page I will try to go back and add indications of such references to sections of the page that were added previously. The listings include update dates; the intention is to make it clear to those who make return visits to this page which content is new since their last visit. Clearly the archive contains a finite number of items and once all content has been added update dates will not be necessary and the page will become a static archive. However it may take some time before that stage is reached. 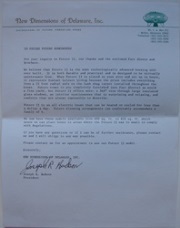 The photo to the left is of a letter [pdf] that was addressed to "Future Futuro Homeowners" signed by Joe Hudson who was the president of New Dimensions Of Delaware Inc.
Joe Hudson is of course still the owner of the Milton, DE Futuro and it was Joe's company that sold Barney Vincelette his Houston, DE Futuro [in which he still lives]. 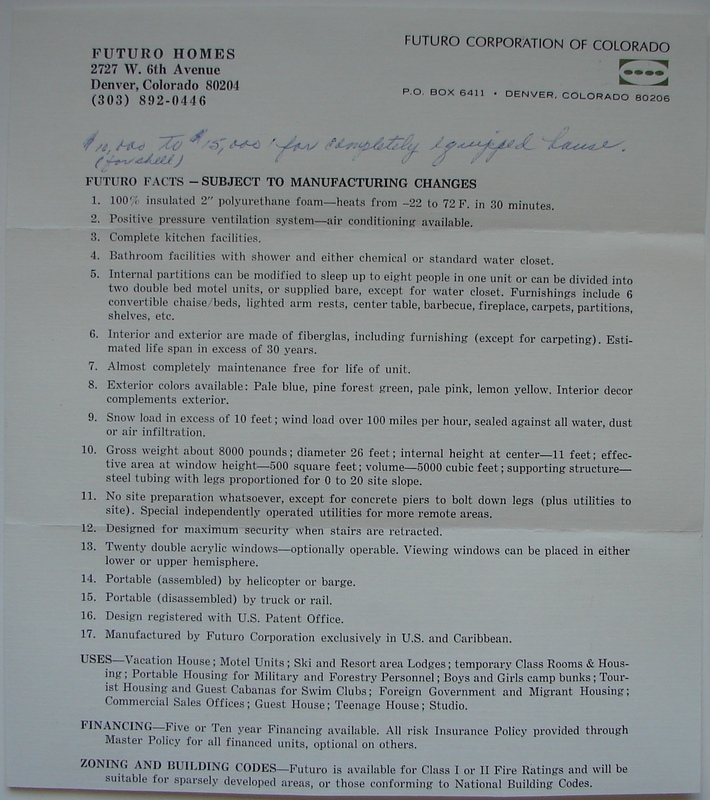 What is particularly interesting about this letter is a paragraph stating that Futuro II was available in three models with square footage ranging from 600 to 820. 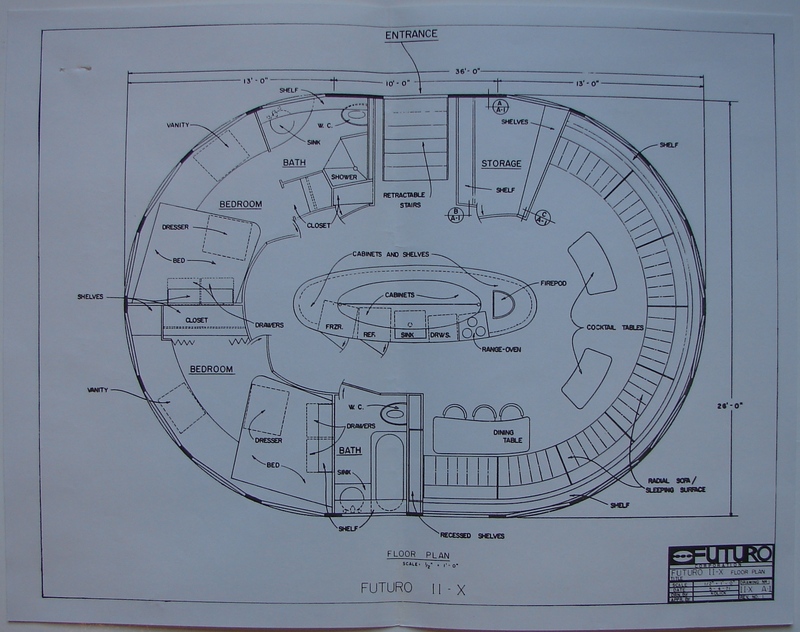 How this additional floor space could be achieved in a Futuro House is likely explained by the architectural plans for the Futuro II-X discussed below. 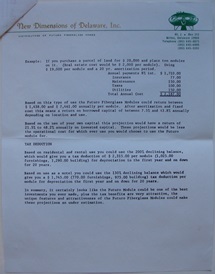 The letter is undated but the marketing package likely dates from 1971 since the Futuro II-X plans are dated April and May 1971. The letter appears to have been the "cover sheet" to a marketing package. The package included several documents and may have been something sent to individuals or groups that had expressed interest in Futuro or it may have been sent to a "mailing list". The package could also have included a customized set of documents depending on who it was being mailed to. 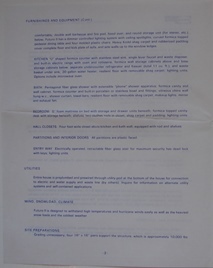 In addition to the "cover letter" the marketing package also included the following documents. 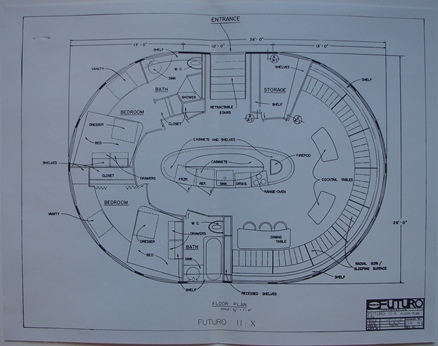 A set of two architectural plans [pdf] for the Futuro II-X which appears to be an "oversized" Futuro model that featured two bedrooms, two bathrooms and a centrally located island kitchen area. 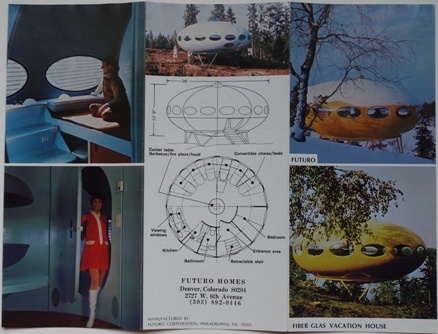 This 9" by 4" color tri-fold brochure [pdf] for Futuro includes photographs of Futuros #000 and #001 located, at the time, in Turenki and Hirvensalmi respectively, several interior shots and a small plan and section. There is no specific indication as to the date of the brochure but there are some clues. 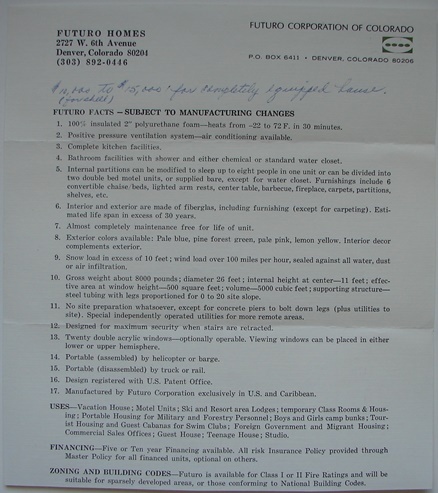 The brochure lists the company as Futuro Homes, Denver, Colorado [which, based on various documents, actually refers to the Futuro Corporation Of Colorado - this "fact sheet" is one example of such a document] but it also indicates that manufacturing would be by the Futuro Corporation Of Philadelphia. 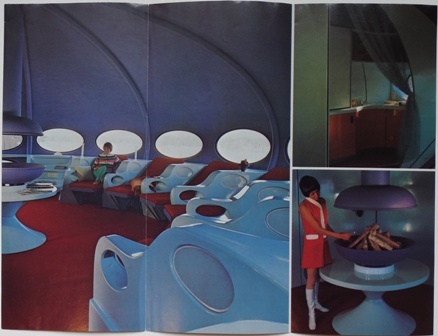 By late 1970 the Futuro Corporation Of Colorado was planning to manufacture Futuro Houses themselves and had already fabricated master molds and begun manufacturing their first Futuro House [this late 1970 Stock Offering Prospectus and this series of photographs refer] which suggests that this brochure was most likely produced mid to late 1970 or before. This 35mm slide of the Turenki photo was located elsewhere in the archive. 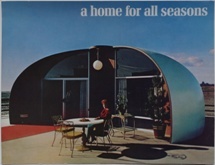 This is a Futuro Homes, Denver single page flyer [pdf] advertising the "Lifetime Fiber Glass House". It was priced at $6,500 and was available in Arizona and New Mexico. 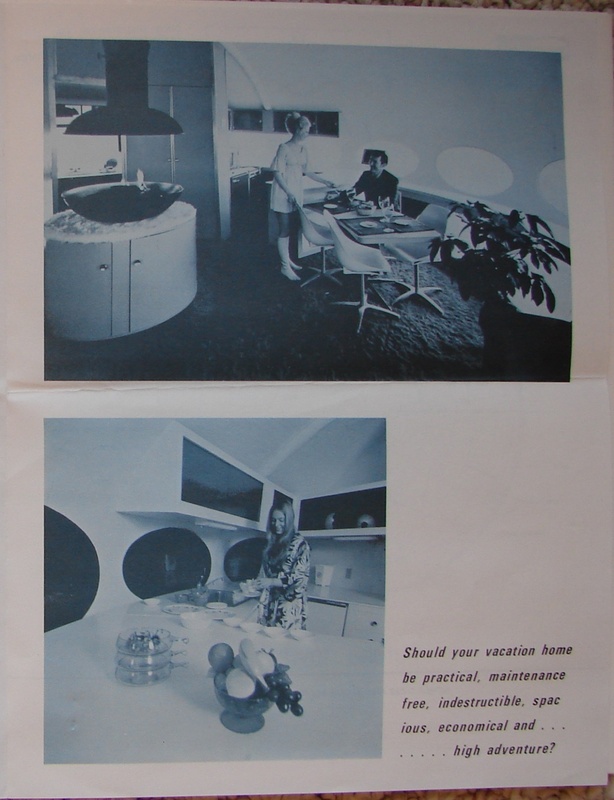 The trading name Futuro Homes, Denver was associated with the Futuro Corporation Of Colorado [this fact sheet refers]. 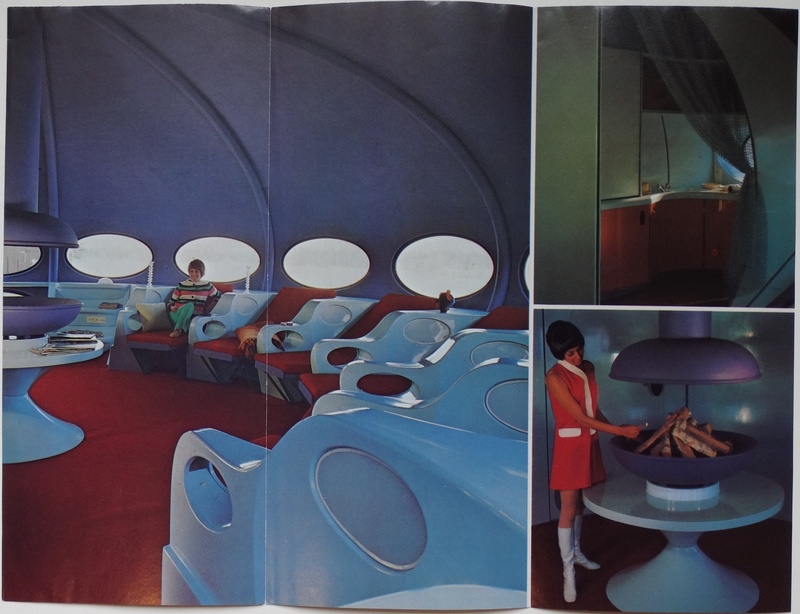 Though not advertised as a Futuro this is clearly the top half of a Futuro [though with no windows and a diameter of 28']. 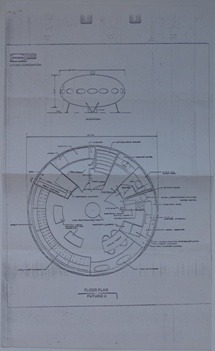 Various documents and photographs found in the archive suggest that the Futuro Corporation Of Colorado intended to manufacture Futuro's with a 28' diameter [these plans are an example] and that they actually only manufactured a single "traditional Futuro" before moving on to a new design [this letter refers]. That same letter describes that design as a "three-quarter" house [almost certainly seen in this series of photographs]. 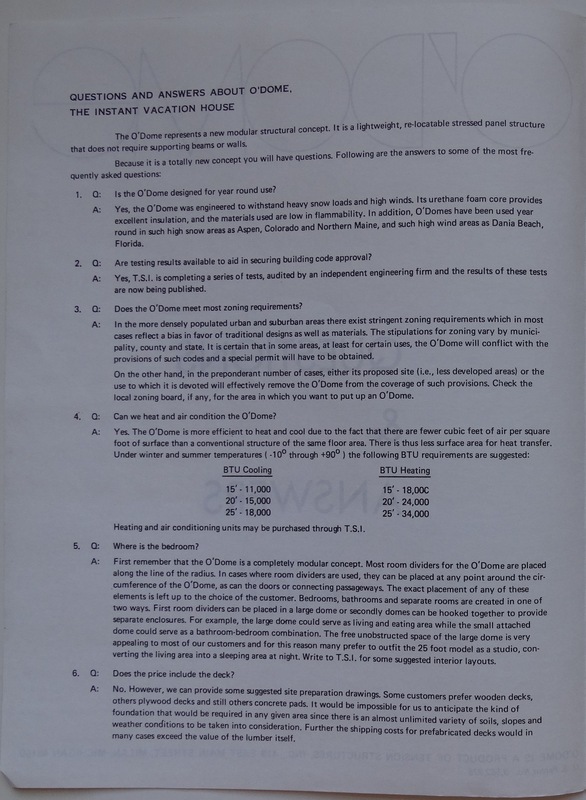 It is unclear if this flyer was ever actually produced, it appears to be the "template" from which flyers would be printed as it is actually a printed sheet with the photo being an actual photo pasted onto the sheet. There is also no indication as to whether the unit was ever manufactured [other than the one example in the photograph] or whether there were ever any sales. 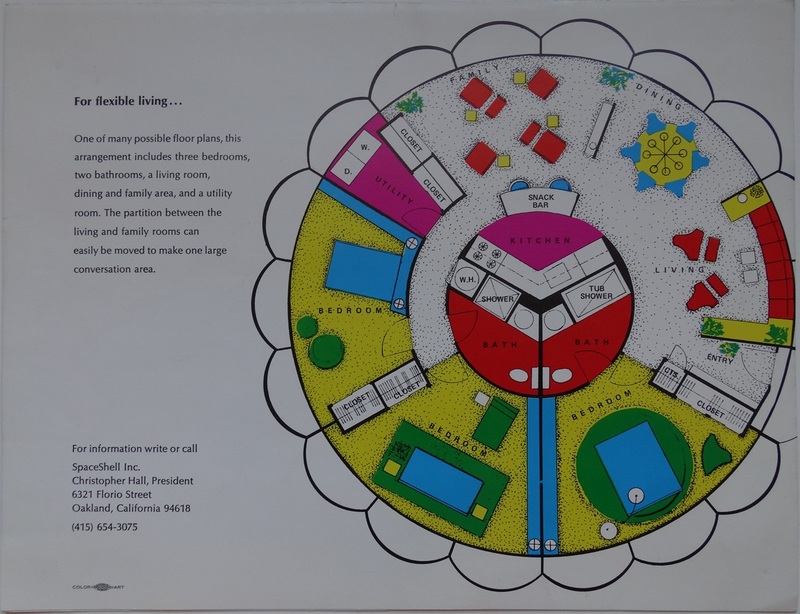 It also seems possible that this may have been an "early" design and that it may ultimately have evolved into the "three-quarter" house. 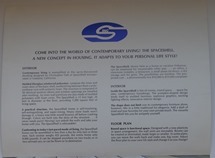 We learn in this late 1970 Stock Offering Prospectus that the Futuro Corporation Of Colorado was invited to display a Futuro at the Colorado Garden And Home Show at the Currigan Convention Center in Denver, Colorado in February 1970. This is an 8½" x 3½" quad-fold flyer [pdf] for that event. The flyer features a graphic of the Futuro on the front and the "Futuro Vacation Home" is highlighted on the front as one of the two main features of the show along with something called "Dancing Waters". On the inside of the flyer the Futuro Corporation Of Colorado as listed as exhibiting at the show on booth 12. 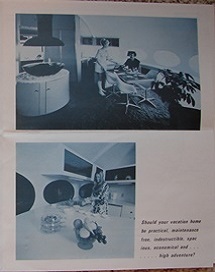 The Colorado company had already been let down once by the Futuro Corporation Of Philadelphia when they failed to deliver a Futuro House to the Colorado company for display at the department store May-Daniels & Fisher in Denver but Leonard Fruchter was again contacted and a Futuro House was promised for the Garden & Home show. However the Philadelphia Company again failed to deliver and a small model of a Futuro had to be displayed at the show instead. According to the Stock Offering Prospectus Cleworth believed several potential sales were lost as a result and this was the start of the decline of the relationship between the two companies. 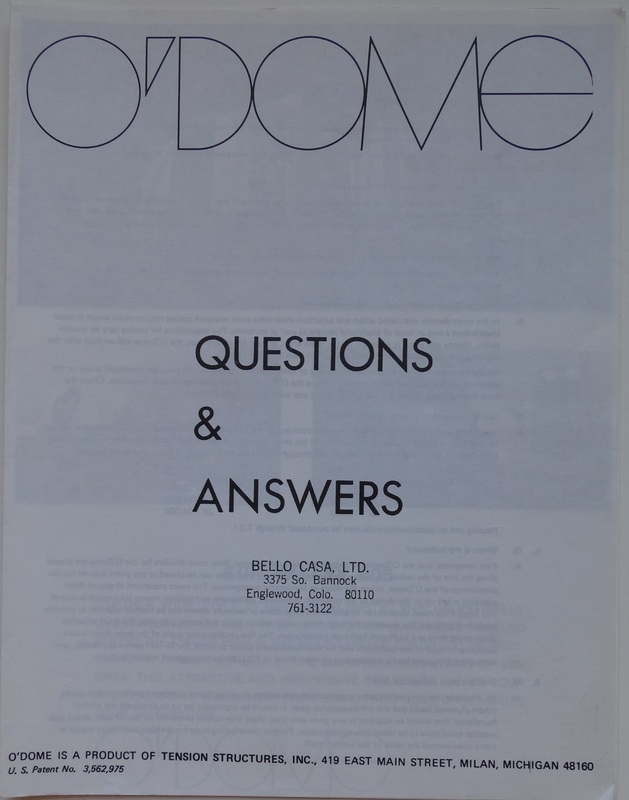 There are several other items in the archive relating to the Garden & Home show including the 020870 issue of the Denver Post, a window poster advertising the show and a pair of photographs taken at the show. My personal collection of Futuro items and memorabilia contains an original press photograph [which actually featured Futuro #000 at the time in Turenki, Finland] relating to the Garden & Home show. 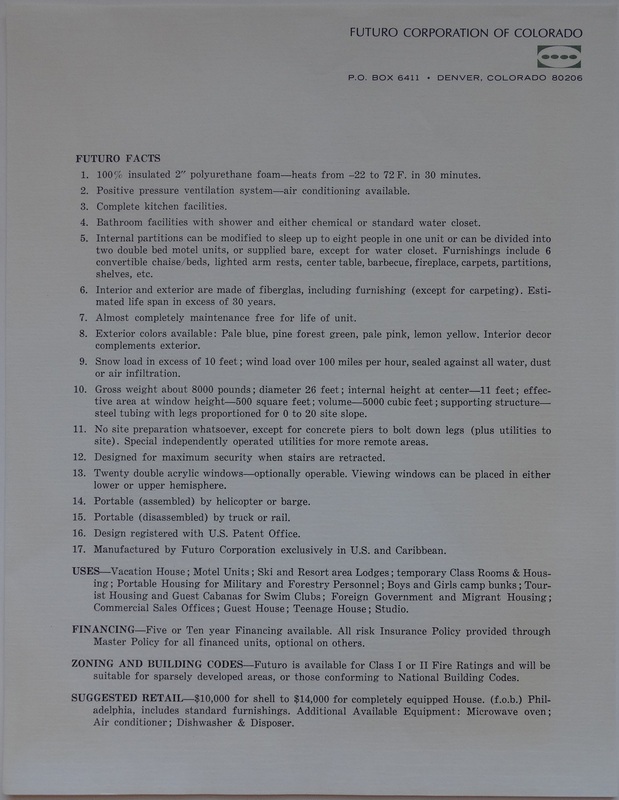 This undated single page "fact sheet" [pdf] is on Futuro Corporation Of Colorado headed stock and is clearly an information sheet for individuals interested in Futuro. The content is similar to [though more concise than] that of a four page "fact sheet" that was included in a New Dimensions Of Delaware marketing package. 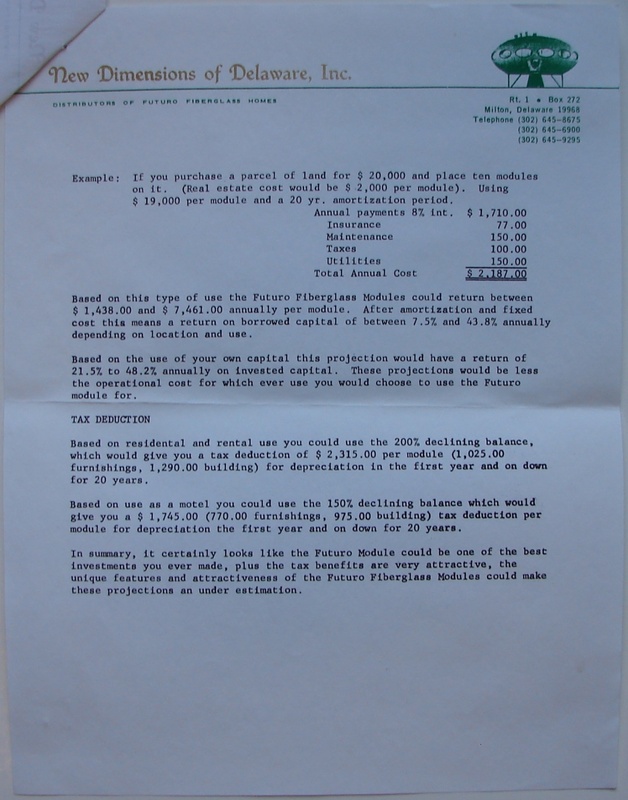 This Futuro Corporation Of Colorado Stock Offering Prospectus suggests the company planned to produce a Futuro that was "substantially larger" than the original Finnish model. 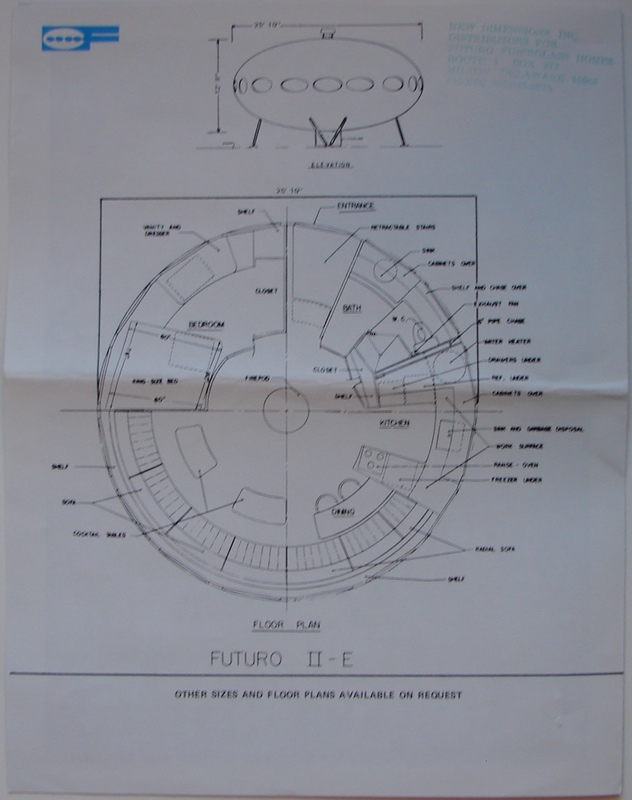 Additionally these David Decker [architect to the Futuro Corporation Of Colorado] plans, dated 110170, depict a Futuro with a diameter of 28 feet rather than the original 26 feet. 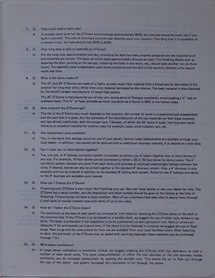 That said the "fact sheet" still indicates a unit with a diameter of 26 feet perhaps indicating it is a relatively early document. 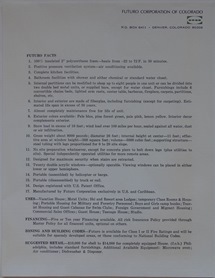 This item is almost identical to a second Futuro Corporation Of Colorado "fact sheet" and it differs in only two respects. On the second "fact sheet" the title line includes the qualifier "Subject To Manufacturing Changes"; this one does not. In addition the other "fact sheet" does not include the last section "Suggested Retail" which includes prices. 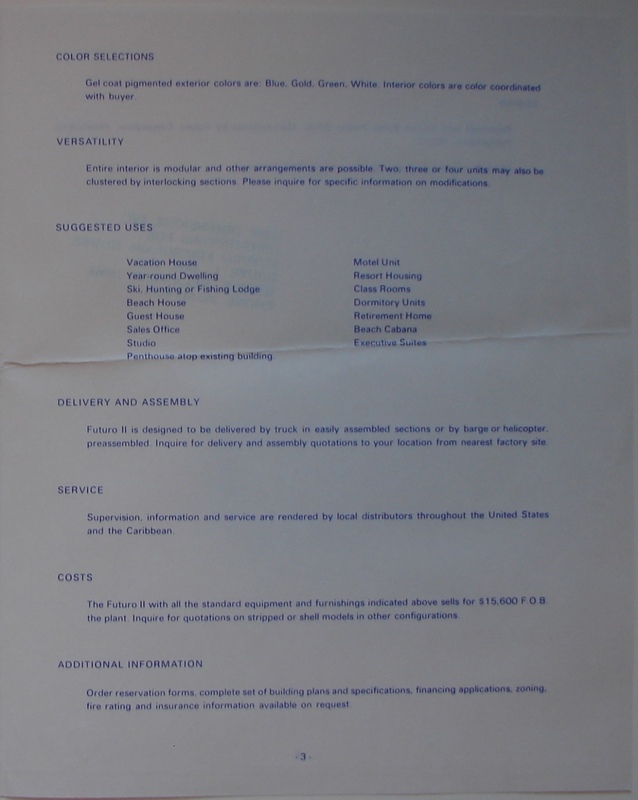 Though purely conjecture it seems likely that the second "fact sheet" was produced later than this one as The Futuro Corporation Of Colorado began to explore its own design for Futuro and thus almost certainly its own pricing. 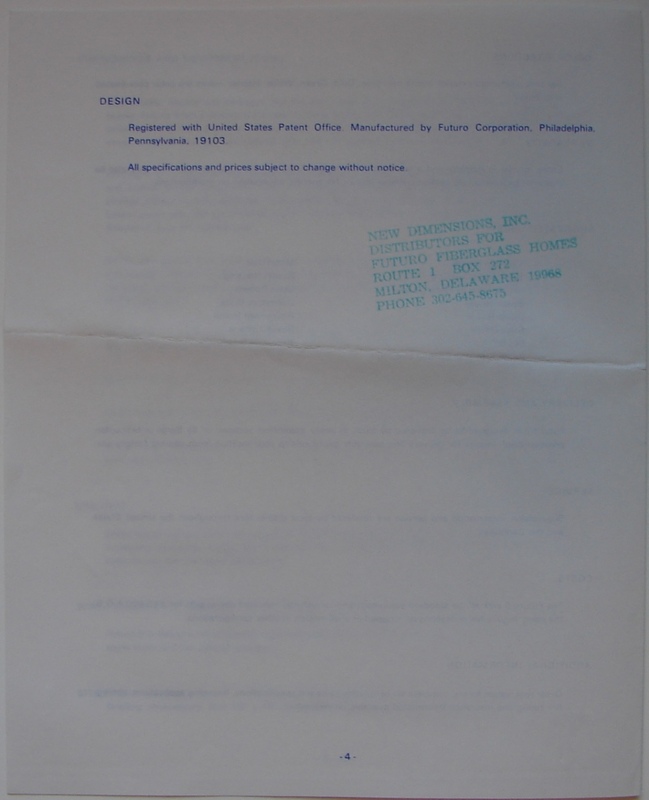 The "fact sheets" were based on a Futuro Corporation Of Philadelphia "fact sheet" and the addition of "Subject To Manufacturing Changes" and the removal of the standard pricing section would certainly reflect the developing plans of the Colorado company. 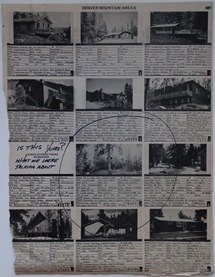 "... buy, sell, trade, lease, distribute, construct, manufacture, dispose of, acquire and generally deal in, at wholesale and retail, all types of houses, buildings and structures ..."
There are various materials related to houses and structures other than Futuro in the archive and the SpaceShell by SpaceShell Inc. is one of them. 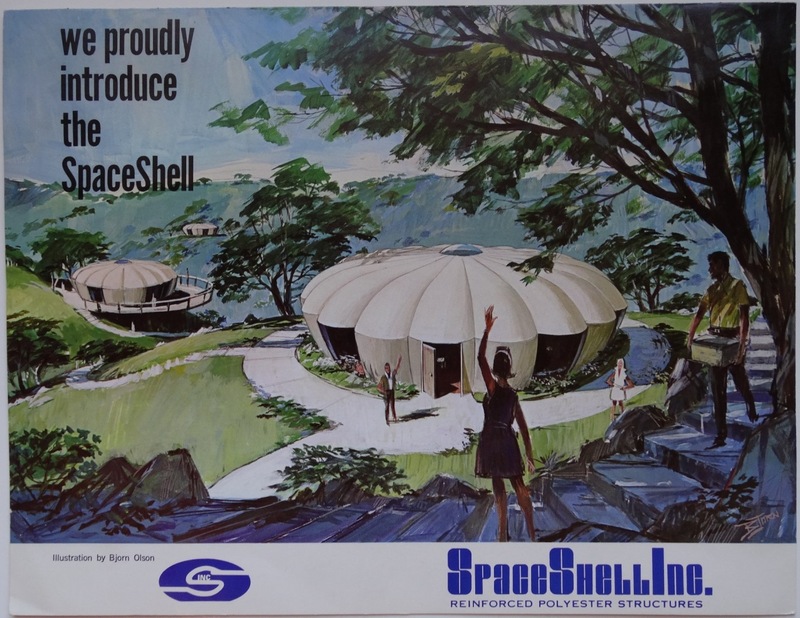 In the case of the SpaceShell the archive contained this four page color brochure [pdf]. There was no other documentation associated with the brochure so it is unclear why the brochure is included in the archive. 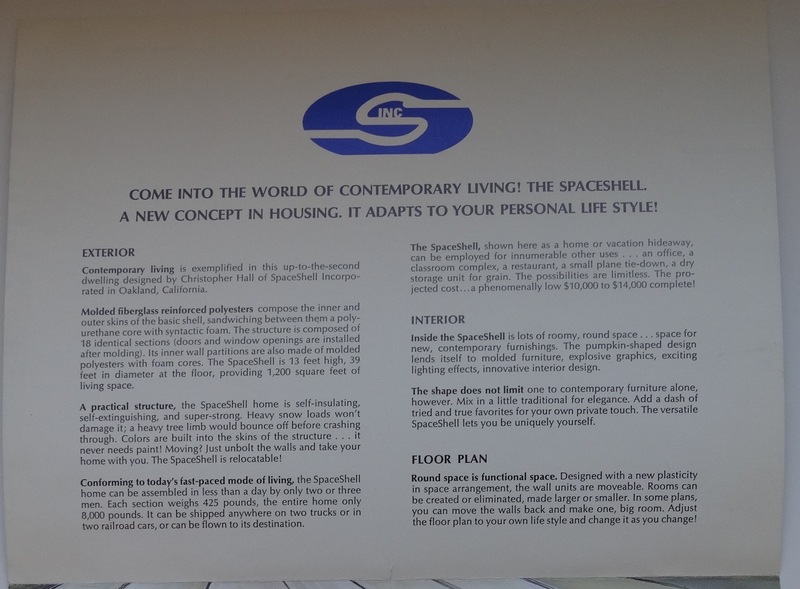 It is quite possible that Cleworth's company was interested in marketing the SpaceShell but it is equally possible that they were simply trying to assess "the competition". 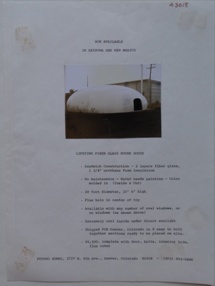 In addition to SpaceShell the archive also contains materials relating to the O'Dome and the WestPoint Pepperell Foam House. This undated page [pdf] from an unknown publication includes a real estate listing for a Futuro House on Clark Road in the Elk Creek area of Bailey, Colorado. 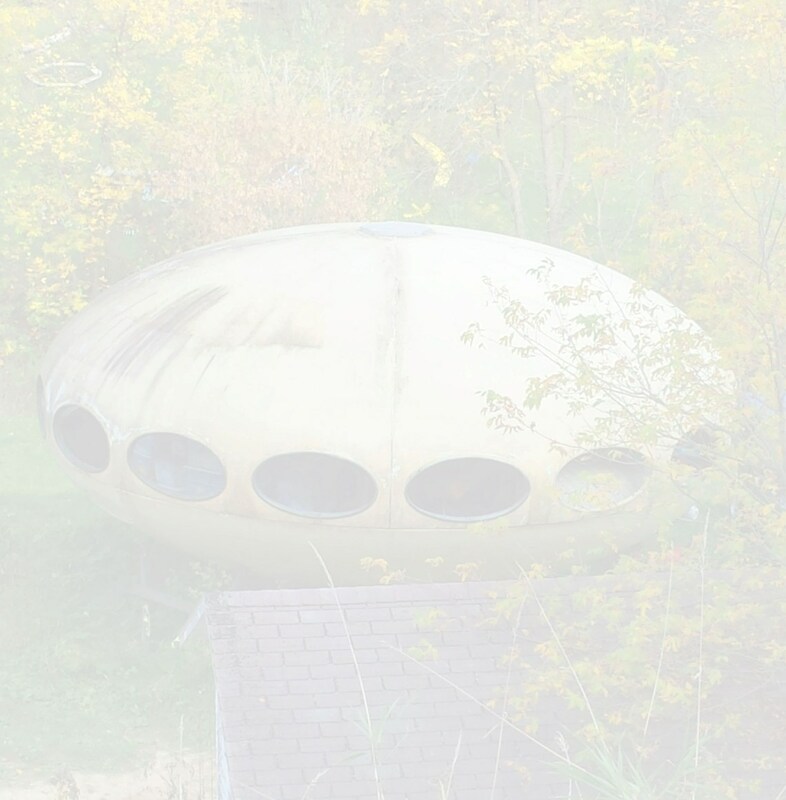 This Futuro has sold and remained on the same site at least twice since the turn of the century and in 2009 it was sold to Mark Haddawy and subsequently moved to Los Angeles, more detail can be found here. 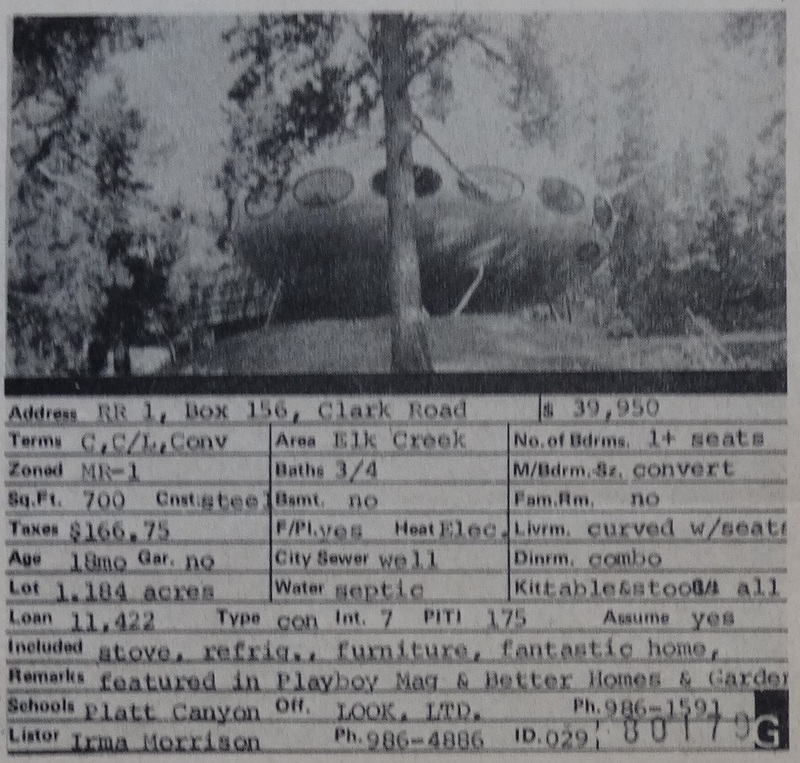 Obviously given its inclusion in this 1970's archive this listing dates from much earlier though the actual date is unknown as is whether the Futuro sold or not as a result of the listing. That said if it did sell it clearly remained on the same property since it was still there decades later. "Is this yours? 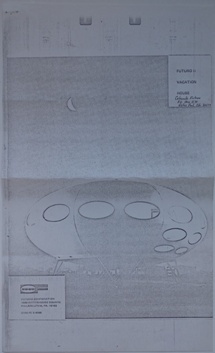 What we were talking about"
There is evidence to suggest that the Futuro Corporation Of Colorado only manufactured a single "standard" Futuro House [this letter refers] and that that Futuro House was located between Littleton, Colorado and Englewood, Colorado until 1974 when it was sold [this correspondence refers]. It is not clear whether this is that same Futuro sometime after 1974 or another unit altogether or, for that matter, if it was another unit whether that unit was manufactured and/or owned by The Futuro Corporation Of Colorado or not. There are various materials related to houses and structures other than Futuro in the archive and the Archdome by Archdomes Inc. is one of them. 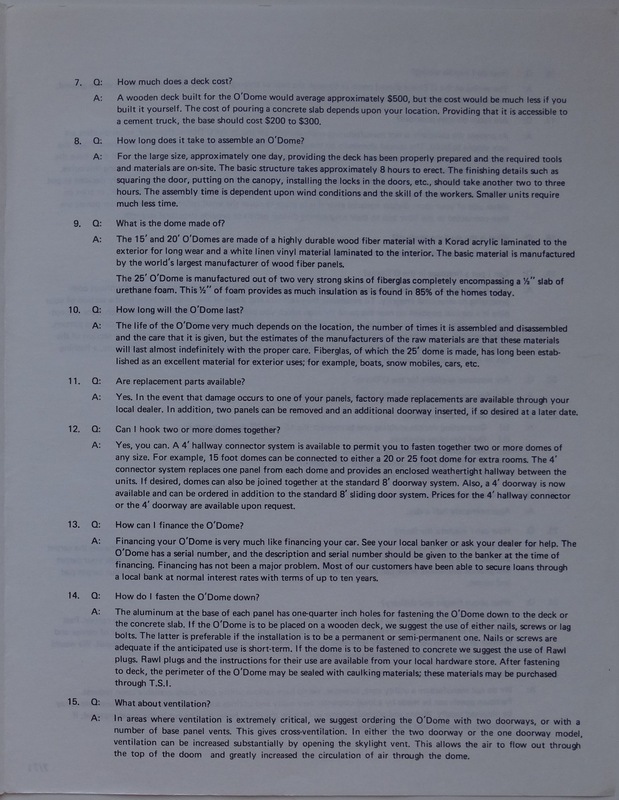 As with other brochures for "third party" structures there was no other associated documentation in the archive so it is unclear what Cleworth's interest was. 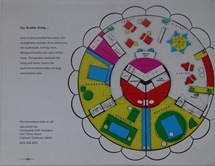 It is quite possible that Cleworth's and his company was interested in marketing the Archdome but it is equally possible that they were simply trying to assess "the competition". 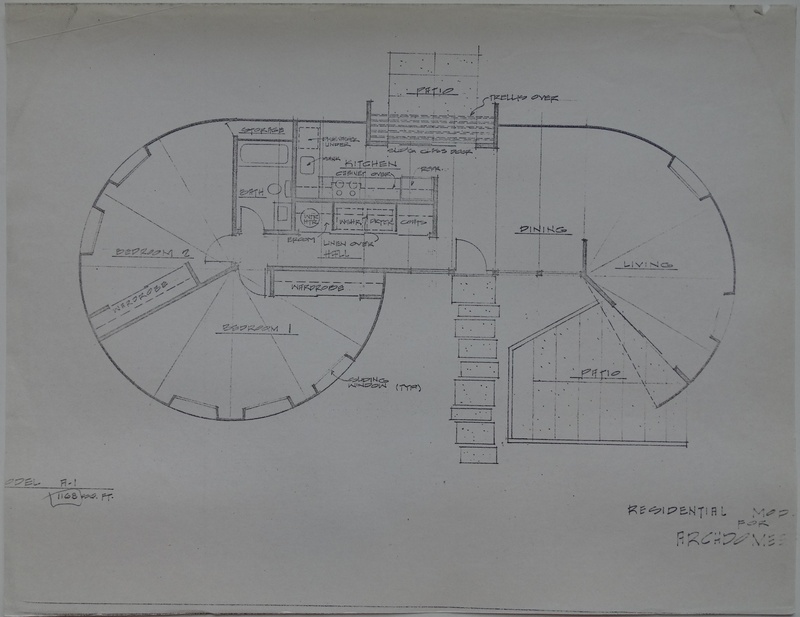 There were two items relating to the Archdome in the archive, interestingly they were located in different files. 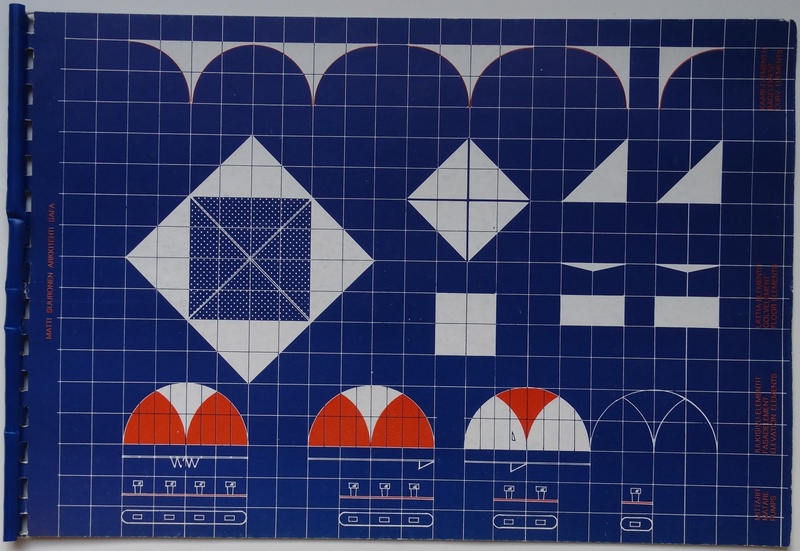 The first was this tri-fold brochure [pdf]. 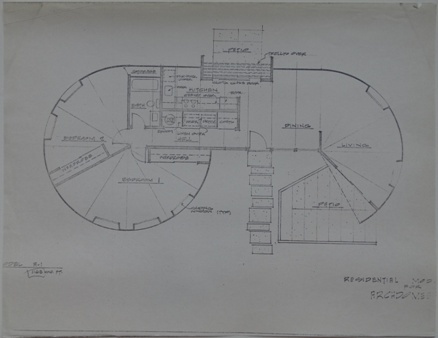 The second Archdome related item found in the archive was this architectural drawing [pdf]. 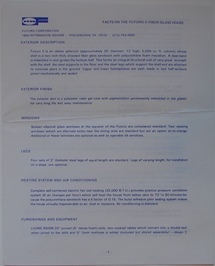 This Futuro Corporation Of Colorado Stock Offering Prospectus suggests the company planned to produce a Futuro that was "substantially larger" than the original Finnish model. 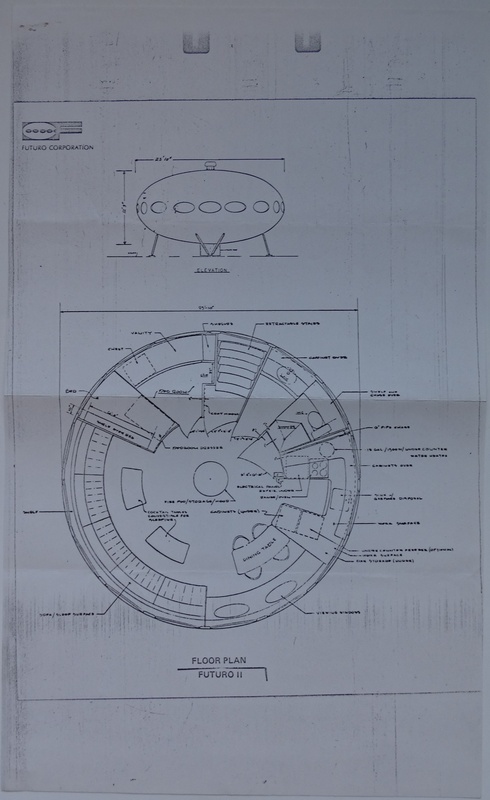 Additionally these David Decker [architect to the Futuro Corporation Of Colorado] plans, dated 110170, depict a Futuro with a diameter of 28 feet rather than the original 26 feet. 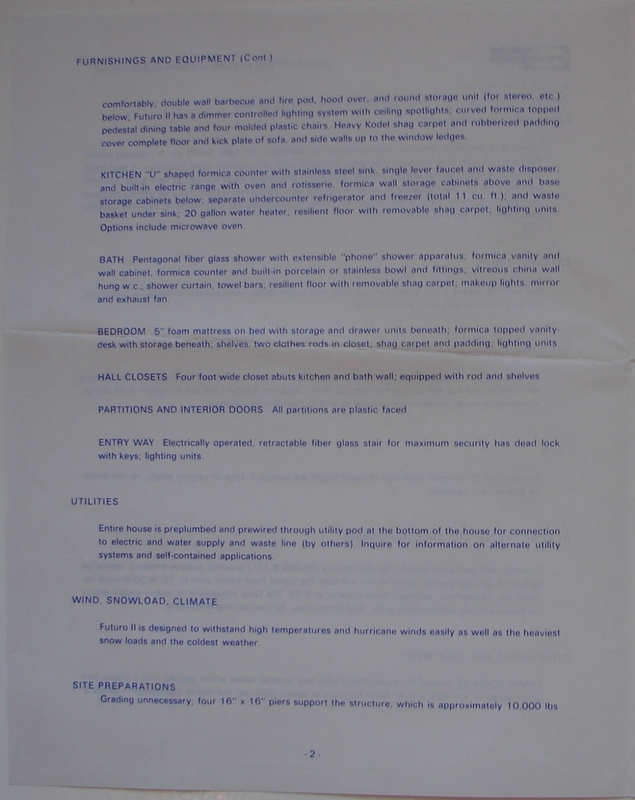 That said the "fact sheet" still indicates a unit with a diameter of 26 feet perhaps indicating it is a relatively early document [and it also carries the disclaimer "Subject to manufacturing changes"]. 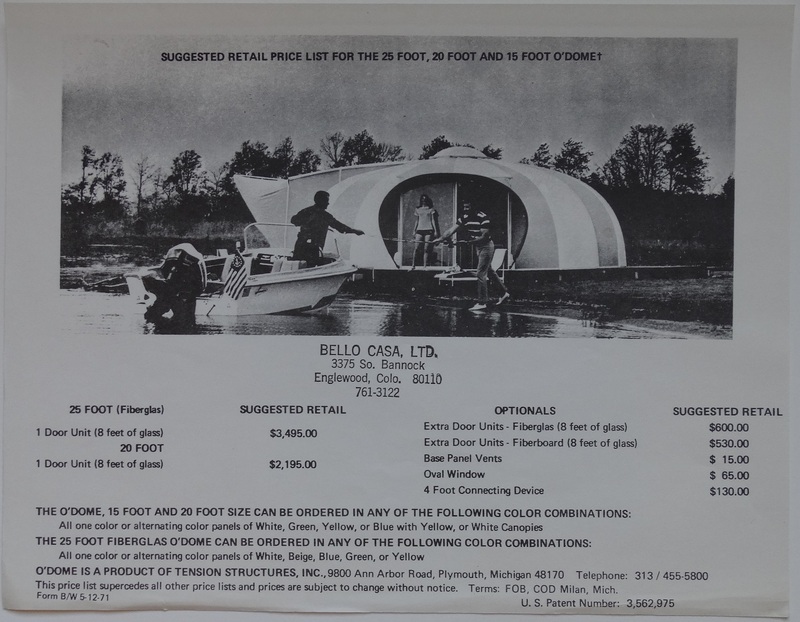 "$10,000 (for shell) to $15,000 for completely equipped house." A second, very similar, "fact sheet" can be found here. It differs only in that it has an additional section listing pricing at the bottom and the title line does not include the qualifier "Subject To Manufacturing Changes". 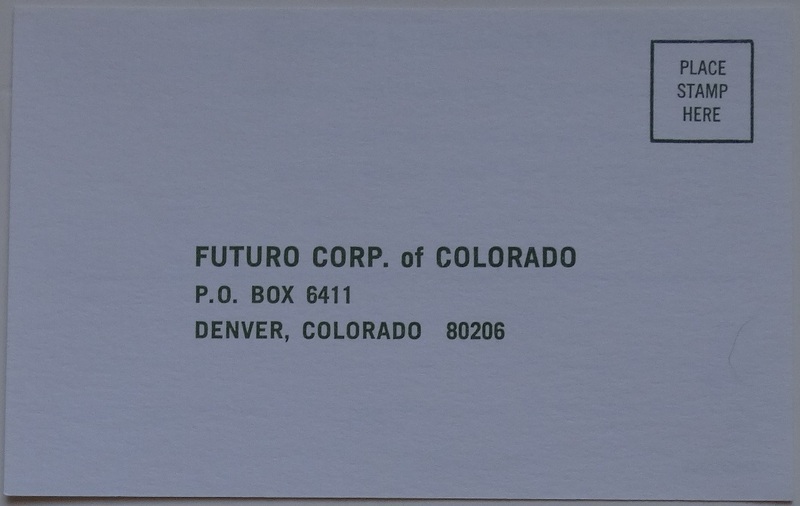 It seems logical that this was the later version as the Futuro Corporation Of Colorado began to work on its own design for Futuro which would almost certainly have resulted in a different cost structure and therefore a different price. 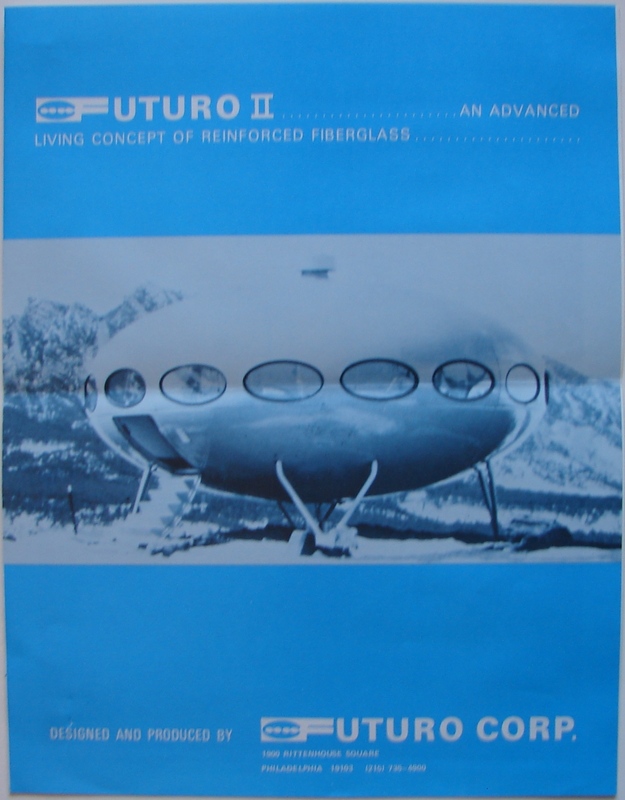 This item [pdf] appears to be a suggestion for a Futuro II brochure for use by the Futuro Corporation of Colorado. 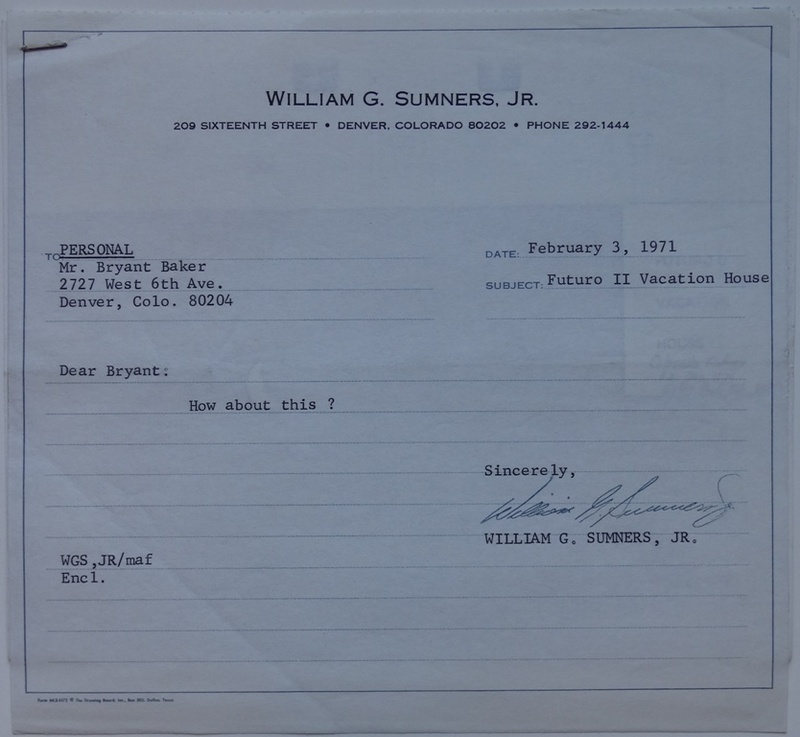 A short 020371 memo from one William G. Sumners Jnr. to Bryant Baker [Vice President & General Manager, Futuro Corporation Of Colorado] reads simply "How about this?" 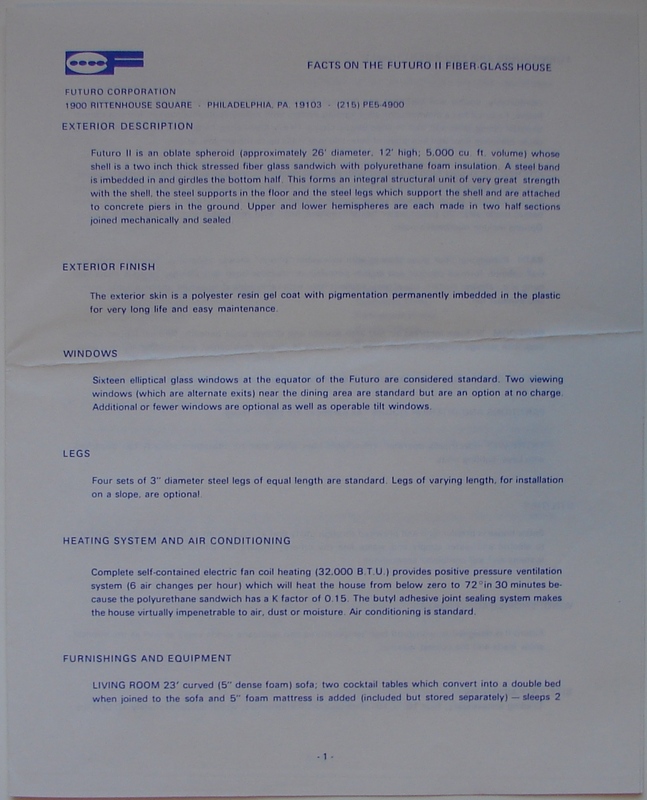 Attached to the memo are photocopies of the front and back of a Futuro Corporation Of Philadelphia brochure [there is a copy of the original brochure in my personal collection here]. 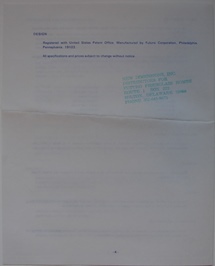 The suggestion appears to be that the Colorado company might perhaps use this brochure with the possible addition of text referencing the Colorado company at the top right of the front page [see the hand written text on the photocopy attached to the memo]. Sometime around mid-1970 the Futuro Corporation of Philadelphia filed for bankruptcy under Chapter 11 [this series of letters refers]. Unlike Chapter 7 bankruptcy filings, which facilitate the liquidation of a company and the distribution of its remaining assets, Chapter 11 filings are more geared towards allowing a company to continue to operate while at the same time restructuring their debt. Unless a separate trustee is appointed the debtor, as debtor in possession, acts as trustee of the business. 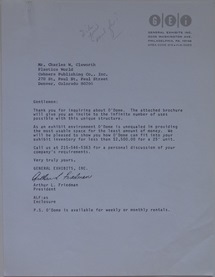 I am not aware of a trustee being appointed to oversee the Futuro Corporation of Colorado and this document and attachment clearly demonstrate that, as of the middle of 1972, Leonard Fruchter and the Futuro Corporation Of Philadelphia were still actively conducting business. 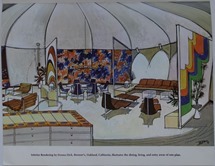 "... reprints of some of the latest publicity on the Futuro, including the Bank landed in Woodbridge, New Jersey and Mr. Cullen's Photo Shop." The attached scans were from the July 1972 issue of the National League Journal and the May 1972 issue of Photo Marketing Magazine. 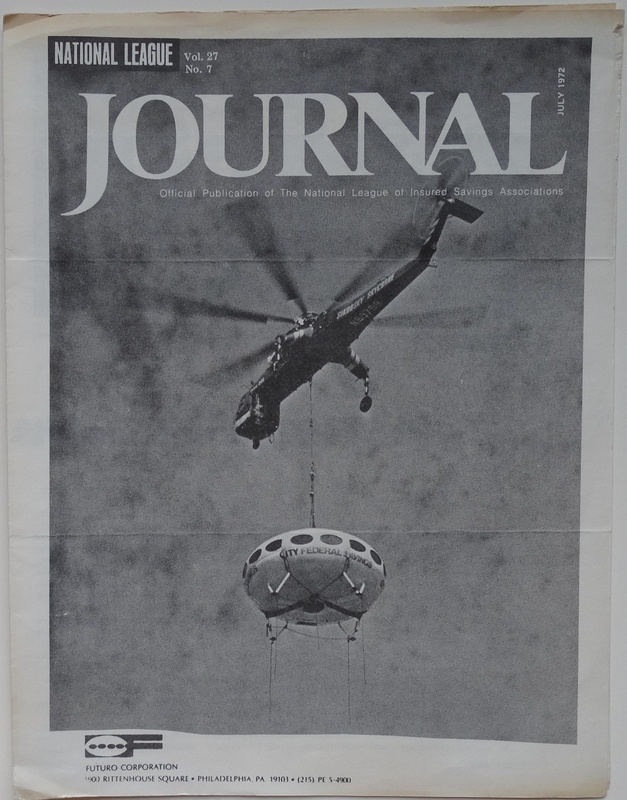 In the National League Journal there was a two page article [and a photo on the cover] reporting on the 060272 delivery of a Futuro to the Woodbridge Shopping Center in Woodbridge, New Jersey where it was to serve as a branch of the City Federal Savings & Loan. The photo of the dedication is, at least to me, somewhat amusing - check out the "Spacettes". 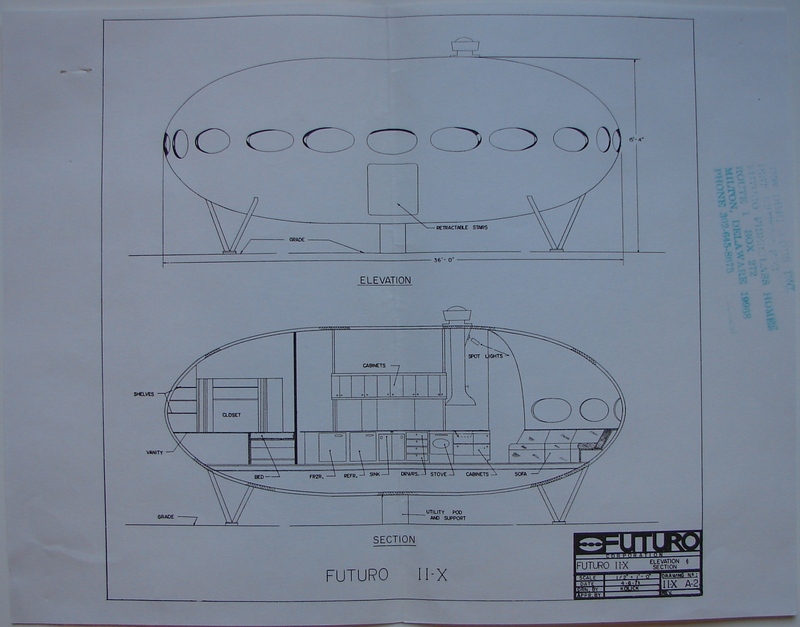 There are two other documented instances of the use of a Futuro as a "Spacebank" in the US and in both of those cases we see a Futuro with a reduced number of windows. 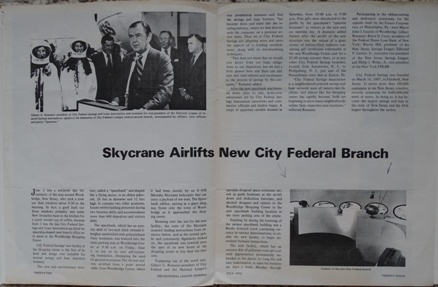 These two airlifts were actually of the same Futuro; Dennis McDonald's article reports that the Futuro delivered to Willingboro was in fact moved from Lakewood. This Futuro is now located in Willingboro and you can find the video "Inauguration of a Spacebank" and a photo of the Futuro arriving in Willingboro on the Willingboro Futuro page. In the past I had heard mention of another "Spacebank" in Woodbridge, NJ but I had not seen photographs and it had never been clear, at least to me, whether this was a second Futuro or perhaps simply the same one moved for a second time. 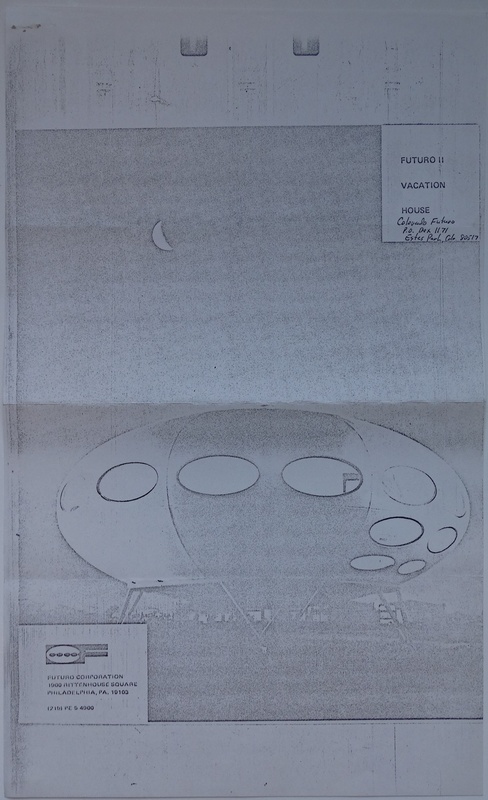 This document clearly and definitively proves there was a minimum of two "Spacebanks" since the photographs seen in the National League Journal clearly show a Futuro with a full complement of windows rather than the reduced number seen in Lakewood and Willingboro. There were two other items related to this event located elsewhere in the archive. 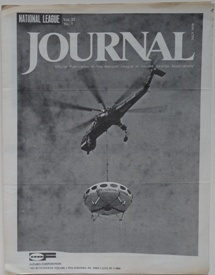 The 062272 issue of Ohio daily newspaper The Plain Dealer carried this short article with a different photograph of the Futuro being airlifted into the mall and there was a print [and negatives] of the photograph of the interior of the "Spacebank" included in the National League Journal article. Photo Marketing Magazine and its article about "Mr. Cullen's Photo Shop" references what is, for me, a new Futuro location; Annandale, VA. 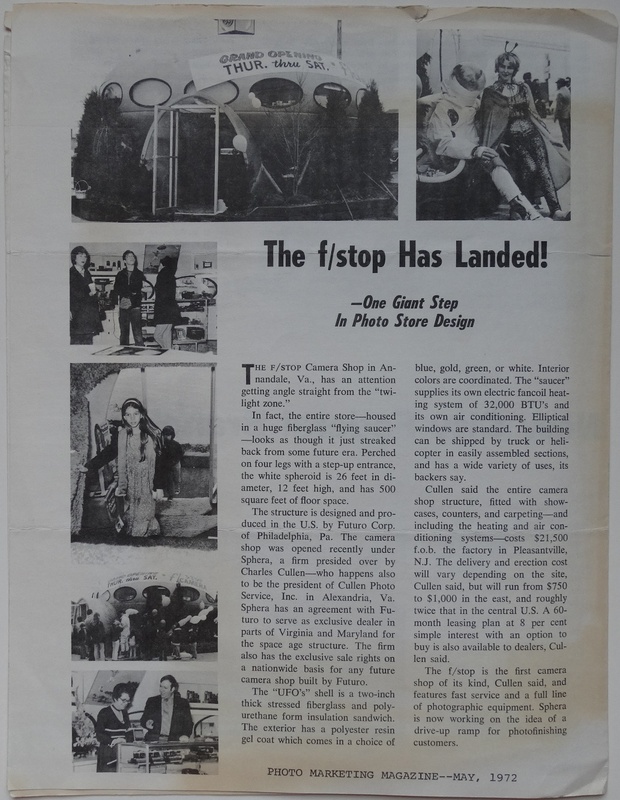 The article dates from May 1972 and reports on the F/Stop camera Shop in Annandale, VA. 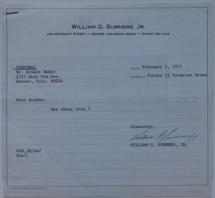 The central character here appears to be one Charles Cullen who was president of Cullen photo Service, Inc and also of a company called Sphera and we are told that Sphera had an exclusive dealership agreement with the Futuro Corporation Of Philadelphia for the states of Virginia and Maryland. 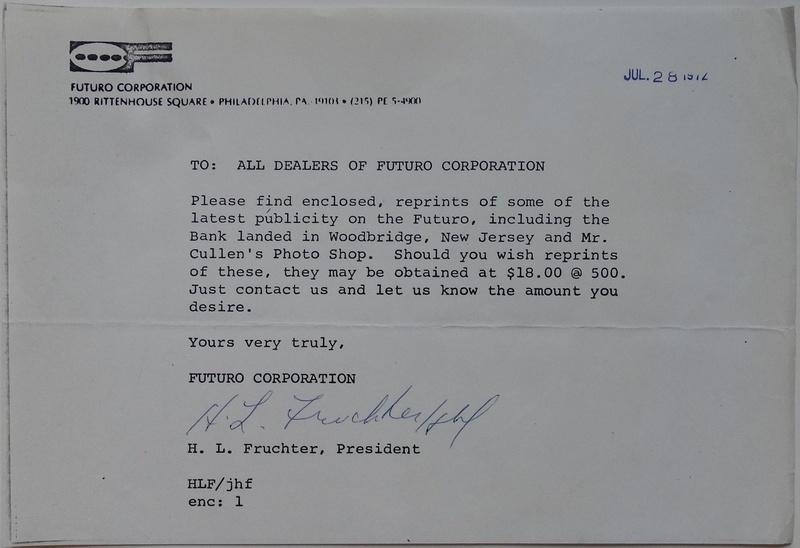 Additionally Cullen's company had exclusive sale rights nationwide for any future Futuro camera shop. 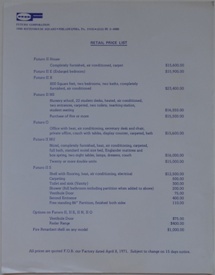 A completely fitted out Futuro camera shop would cost $21,500. The article indicates that this was the first camera shop of its kind and I have never come across any report of another. The photographs of the Futuro and in particular of the arched entrance structure are interesting and suggest to me that it is quite likely that this Futuro is the one that took up residence on Van Buren Street in Annapolis, MD sometime in the 1980's. Check out the photo of the Annapolis unit here and note the shape of the arched entrance, the fact that one of the support struts to the right passes through the entrance structure and the placement of the entrance structure which causes the top of the arch to obscure the lower part of one of the windows. All of those same features can be seen in the photos of the F/Stop Camera Shop. 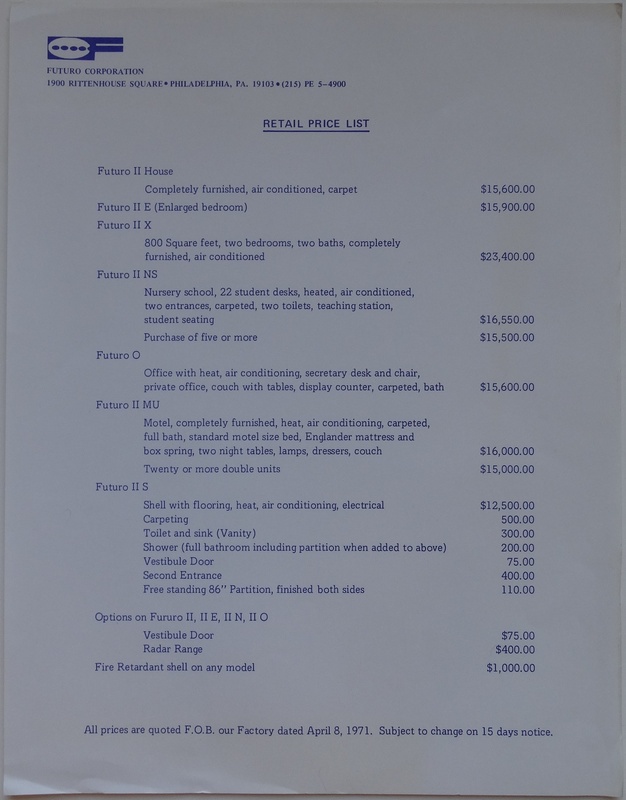 This Retail Price List, published by Leonard Fruchter's company, The Futuro Corporation Of Philadelphia, [pdf] lists prices as at 040871. Prices range from $12,500 for a Futuro II S, a shell with Flooring, Heat, A/C and Electrical through $15,600 for a fully furnished Futuro II with A/C and carpeting to $23,400 for the oversized, 800 square foot [never to my knowledge produced] Futuro II X [Futuro II X plans can be found here]. 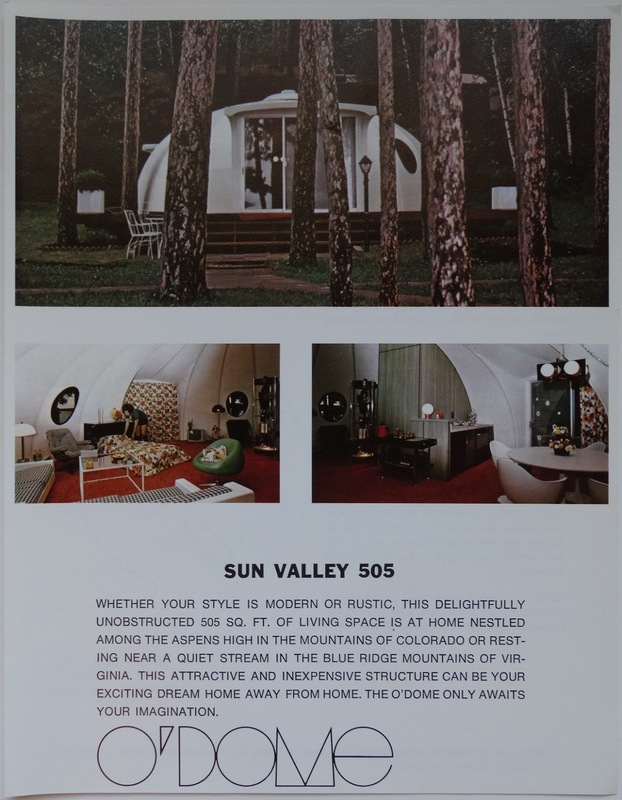 Various other configurations are also listed including Futuro II E which featured a larger than standard bedroom, Futuro II NS for Nursery Schools, Futuro O designed as an office unit and Futuro II MU which was aimed at the motel business. 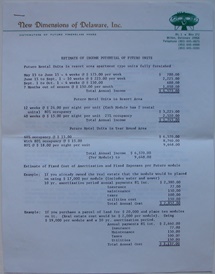 Various "options" are also listed and priced and the document includes details of discounted prices for multiple purchases of the Nursery School and Motel units. 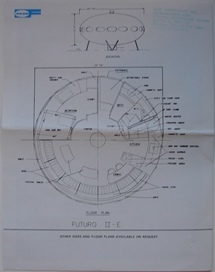 There are various materials related to houses and structures other than Futuro in the archive and the O'Dome is one of them. "We will be pleased to show you how O'Dome can fit into your exhibit inventory for less than $2,500 for a 25' unit." 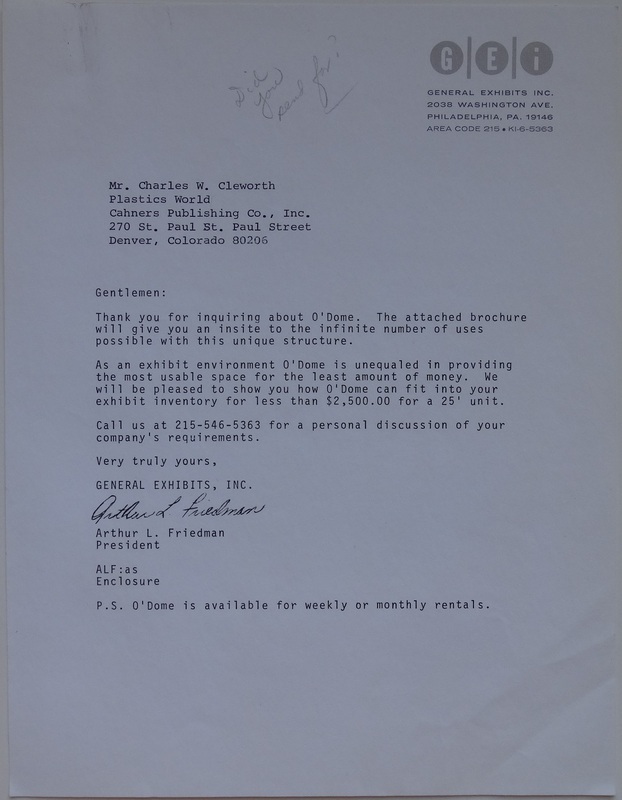 Based on the fact that the letter was addressed to Cleworth at Plastics World and not at The Futuro Corporation Of Colorado and the reference to "exhibit inventory" it is unclear whether Cleworth's interest was in O'Dome as something his company might be interested in marketing, something he wanted to report on in his publication or something that he might be interested in as a structure he could use at exhibitions when marketing the Futuro or any other structures he was marketing at the time. 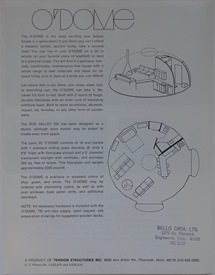 Though the letter refers to "the attached brochure" there were actually several items related to O'Dome found together in the archive. It is unclear which was the particular item referred to in the letter. This quad-fold brochure [pdf] seems to me most likely to be the one referred to in the letter. 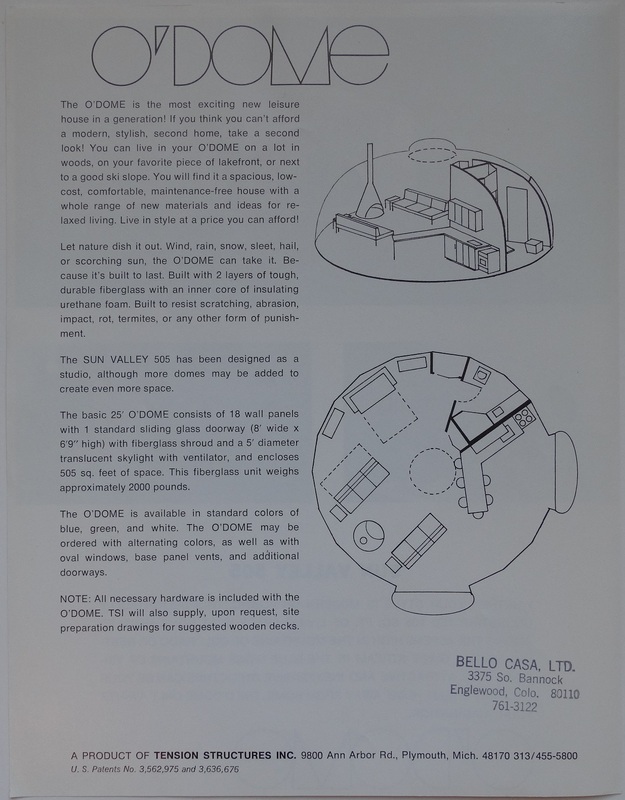 Included in the brochure are various drawings, diagrams and photographs along with information on suggested uses for O'Dome, specifications and information on assembly. 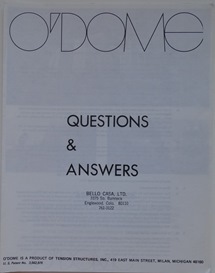 and this four page "Q&A" sheet [pdf]. 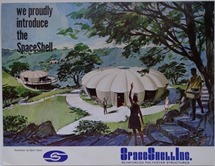 In addition to O'Dome the archive also contains materials relating to the SpaceShell by SpaceShell Inc. and the WestPoint Pepperell Foam House. 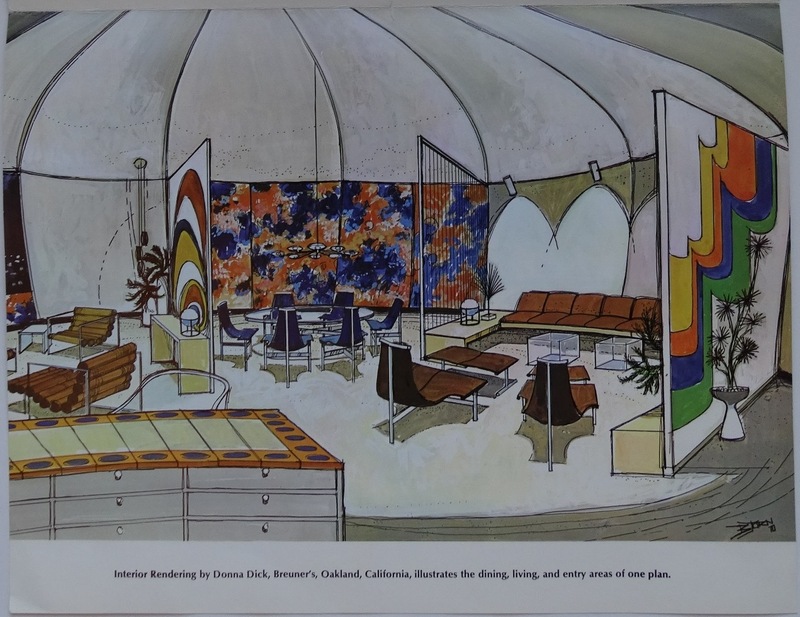 In this late 1970 Stock Offering Prospectus we learn that the Futuro Corporation Of Colorado was invited to display a Futuro at the Colorado Garden And Home Show at the Currigan Convention Center in Denver, Colorado in February 1970. This 22" x 8½" poster [pdf] was clearly designed to be fixed to a window since it is double sided. The poster appears to be unused as the paper covering the adhesive strips on one side is still in place. 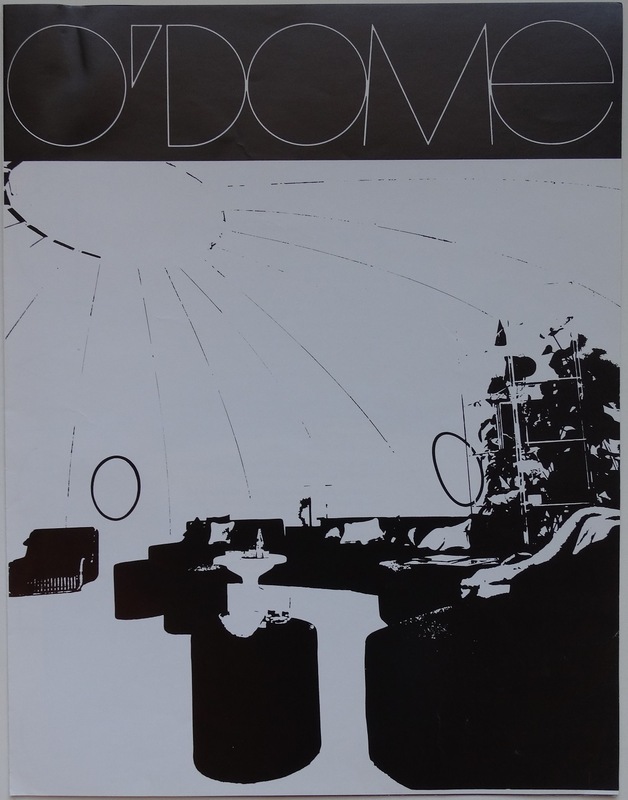 On one side the poster features a photo of Futuro #001, located at the time in Hirvensalmi, Finland [and now located in Espoo, Finland at the WeeGee Exhibition Center]. The photo has been "edited" post printing in that someone has "squared off" the windows. 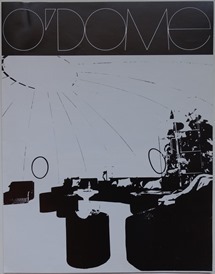 In this series of February 1970 [the time of the show] Design Studies David Decker, architect to the Futuro Corporation Of Colorado, included drawings of Futuros with different window shapes including one with rectangular windows which looks a lot like the way this poster has been "edited". 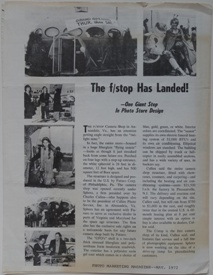 There are several other items in the archive relating to the Garden & Home show including the 020870 issue of the Denver Post, a flyer advertising the show and a pair of photographs taken at the show. 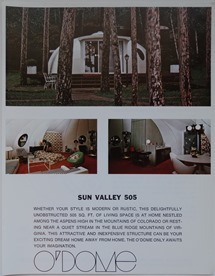 In addition my personal collection of Futuro items and memorabilia contains an original press photograph [which actually featured Futuro #000 at the time in Turenki, Finland] relating to the Garden & Home show. 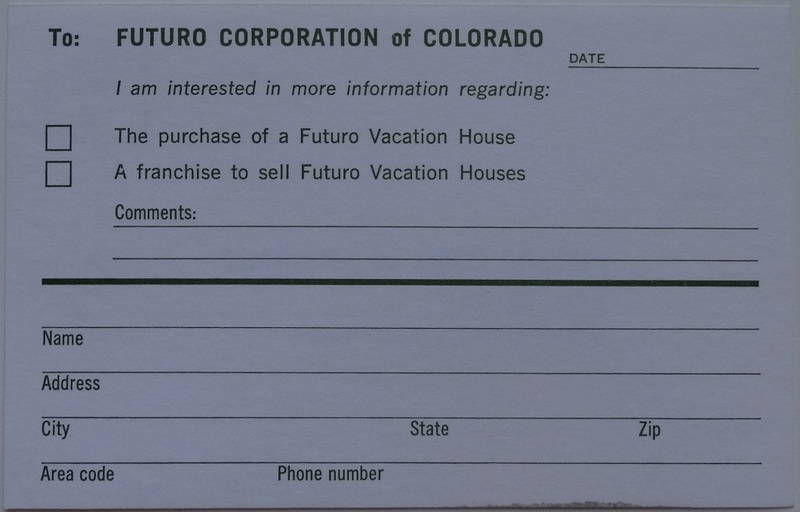 This is a simple, unused, postcard [pdf] designed to be completed by a prospective customer and then returned to The Futuro Corporation Of Colorado. The postcard allows the prospective customer to indicate whether they were interested in purchasing a Futuro or opening a Futuro franchise and to provide contact information. 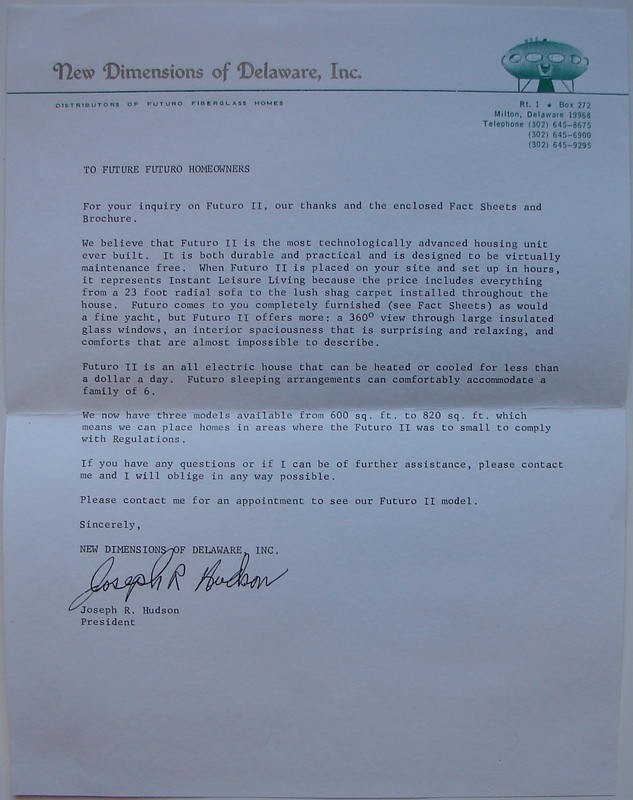 In a 120470 letter to Charles Cleworth Polykem proposed a business arrangement that would involve the licensing in the US of Polykem's "new house" along with the CF-100 to Charles Cleworth's Futuro Corporation Of Colorado. That letter was accompanied by several other letters and documents. 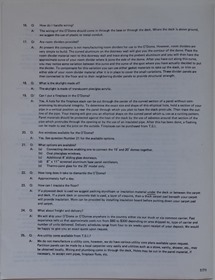 This booklet [pdf] was among those documents. 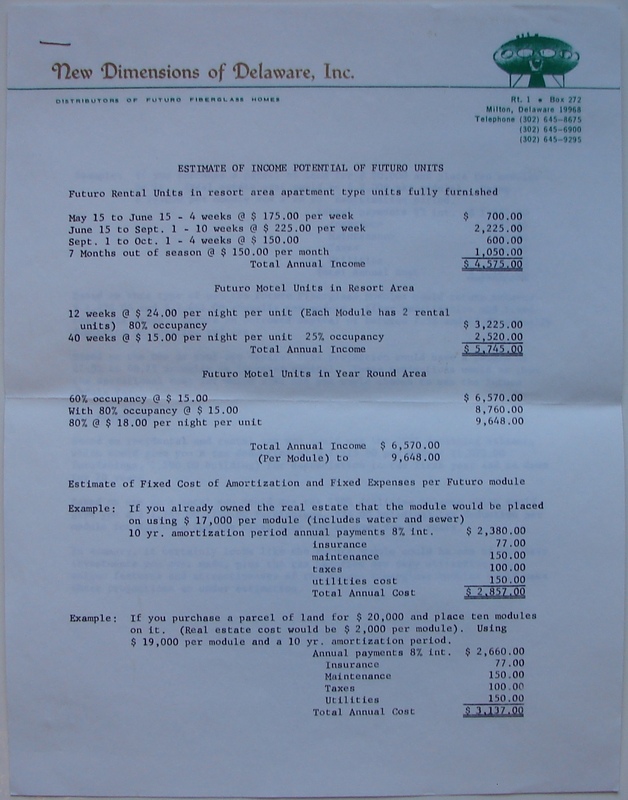 The booklet is Gulf Oil branded and appears to be either some sort of sales or marketing brochure or perhaps even an internal Gulf Oil presentation document. The booklet includes some sort of development plan and several artist's renderings of the CF-100 Filling Station and CF-200 Service Station.